Finally recovered from another rockin’ Billy weeekend. It all started on Fri morning as we dressed the stage and room with Billy pictures and memorabillia. Fans from all over the country arrived at the Grand Metropole Hotel. Some even arrived the night before to get settled in early for the big weekend. Late afternoon the stage was set and by now everyone was in the concert room talking with old and new friends about Britain’s finest rocker. Mo and Bob Cooper were there with a great gear stall and Billy’s music was being played in the background. I took to the microphone and welcomed everyone to the hotel, ran through the programme of events and sang A Million Miles From Nowhere. Then we had a toast to Billy and a great weekend. It was time to introduced the new DJ for the weekend, Jim Killey, who played Billy and other artistes of the era. Everyone was in a great mood and dinner was served. 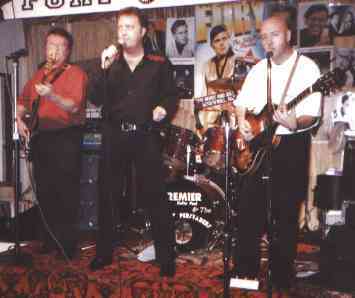 At 8.15 pm myself and the Persuaders took to the stage with a full hour of Billy Fury classics, Cross My Heart, I’m Lost Without You, Turn Your Lamp Down Low, Running Around, Forget Him and many more. We paid our respects to Martin Davies our bass player who lost his wife a few weeks back and introduced Dominic on bass for the weekend. He's a great guy and player and was brought to our attention by Albie, who used Dominic and his band at the Southport Theatre in summer. Jim was back on the decks,then a very talented performer , Gerry Sandon, was introduced. 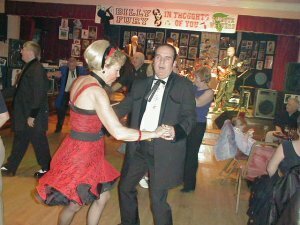 Gerry has worked the Billy weekends before and his mix of 50s and 60s greats instrumentals and a great vertion of Halfway To Paradise went down a treat. 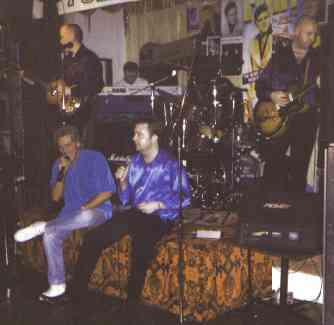 Myself and the guys were back on stage about 11pm with a rock 'n' roll spot including That’s Love, Nothin’ Shakin’, Walk The Line Revisited, Johnny B Goode among others. Jim rocked till the early hours and then it was off to bed. Saturday’s schedule began at 11am with Sarahlea's jiving lessons and wow what a great turnout. Everybody had a great time jiving to Billy's rockers, Dont Knock Upon My Door, Get On The Right Track, Mean Woman Blues, Sweet Little Sixteen. Have I Told You Lately and others all from the new Billy At The BBC album. And even the rock 'n' roll charleston to Running Around. The place was jumping and a great time was had by all. Even the first time dancers were through to enter the jive comp on Sunday morning. The fan club set up a fantastic memorabillia stall – CDs, DVDs, posters, pens, books, T-shirts and much more. Everything any Billy fan could ever want. Saturday afternoon was free to walk the golden [windy] mile and everyone who ventured out came back with the Fury quiff. After dinner Jim took to the stage and again at 8.15pm myself and the guys performed a tribute to the 60s, Save The Last Dance For Me, I’d Never Find Another You, Bad Moon Rising, Fool’s Errand, I Will and so many more. At 9.45 it was time to introduce the one and only Albie Wycherley. Who better to pay tribute than Billy’s brother? All the hits were there including It’s Only Make Believe, Wondrous Place, You Don’t Know and showed he could rock with the best of them with My Babe, That’s Love and a fantastic vertion of Mess Of Blues also a surprise rendition of It’s Now Or Never, finishing with It’s Only Make Believe and Halfway To Paradise. Everyone at the front of the stage and as usual Albie at his best. Again CPP hit the stage with more rockin classics, among others, Summertime Blues, Move It and the very popular Unchained Melody. More of our Billy was to follow inclusing A Thousand Stars, Collette, Nobody’s Child and Once Upon A Dream. The evening drew to a close at about 3.40. Sunday morning was soon with us and Jim was on the decks at 10am playing a full hour of Billy although he did admit he didnt want to step on ours or Albie’s toes by playing too much Billy. I told him Billy recorded enough material that he could never disappoint in playing as much as he and the fans want. He promised he would get it right for February. Overall for his first time Jim did a first class job. At 11.30 the jive competition was under way and the dance floor was packed. Three winners were chosen and one couple were from the dance with Billy class the day before. Well done to all who entered. 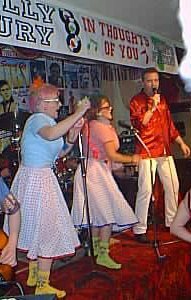 Then I hit the stage without the Persuaders, singing I'll Show You, Because Of Love, Devil Or Angel and other classic Fury tunes. Then it was the turn of the public to get up and sing their fave Billy song and as always some great singers. A guest appearance of Albie who sang fantastic vertions of Give Me Your Word, Jealousy, Open Your Arms and My Christmas Prayer. Albie thanked everybody for coming to the weekend and then we had the great Billy Fury quiz. What a great success this was with some of the questions set by Jean and Albie. Most people had a go and we had three winning teams who answered most of what we thought were tough questions and everyone else learnt a lot more about our hero. Diane Wardle the weekend host and organiser said a few words thanking Jean, Albie and everyone one for coming and making it a great weekend. She presented Jean with some flowers then Jean took to the microphone thanked everybody and sang a moving vertion of In Thoughts Of You. The weekend had now come to a close and we all look forward to February. In closing i would like to thank everybody who attended the weekend. Thanks for all your kind words regarding Martin, his children and the band. You truly are the greatest. We look forward to seeing you all soon. Regards Colin Paul and the Persuaders. wanted to get to Blackpool early. I did not take into account the huge car park otherwise known as the M6. We were stuck in a traffic jam for hours. We finally got parked and made our way to our rooms. To keep us going we had a few Vodka and Red Bulls and made our way down to the ballroom. Friday night was great. Colin (pictured left) and the boys were on top form. I also met Colin's Mum and sister and her partner who were very nice. It was great to see Danny Rivers and his better half. Danny gave a great set with the Pretenders which everybody enjoyed. Then it was the turn of Dean Memphis who played a 1½ hour set of rock 'n' roll which kept the dance floor full. After a few pints and a glass of red wine with Jenny and Vic it was my turn to put my dancing skills to the test (not a pretty sigh). We rocked the night away and finally got to bed at about 2am. Saturday (massive hangover) to get rid of. A swift walk along Blackpool prom did the trick. Someone decided it would be a good idea to have a look round town so Pat, Karen, Eric, Margaret, Chris and I set off to the local memorabilia shop where they had some nice Billy things. I did not think it was very likely we would have a power cut at the Metropole! Friday night was great but Saturday was even better. The entertainment was first class, with Colin, Graham Holly, Danny Rivers, and Albie giving fantastic performances. 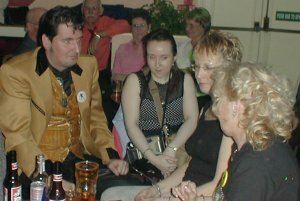 I was chatting to Danny and his wife and he was telling some wonderful stories about when he was touring with Billy, Marty, Dickie Pride, Eddie Cochrane, and Gene Vincent. I just wish I had had a tape recorder on me. It is always a pleasure meeting up with friends from the message board and it was great to see Marie, Fran, and Babs having a good time. I have saved the best for last and make no apologies for doing so. This chap who everyone loves should be given a knighthood for all the happiness and fun he gives everyone. He is always so thoughtful and full of surprises and on top of all that he has a great singing voice ( I hate him). No, that could not be further from the truth, we all love him to bits. It has to be the one and only Daniel, pure magic, he kept everyone entertained and even managed to Billy Joe Pascall and Ken Dodd. Saturday night moved into Sunday morning and we finally hit the sack at 5am. the ballroom later in the morning to see Colin singing and the jiving contest. A few others got up and sang a few songs and then it was time for Chris Eley to do his bit. He presented Jean (who looked wonderful) with a nice bouquet and went on to thank various people, and finally to present the three students with their prizes which was a very nice idea. I spoke to them briefly afterwards and found them to be worthy winners and nice lads. We left after dinner and after dropping off Pat and Karen made our way home exhausted but feeling great. Roll on 15 March when we can do it all again at Skegness. I have these two pictures from the Blackpool event in February, but I'm sorry, for the life of me, I can't remember who sent them to me. A report would also be welcomed. 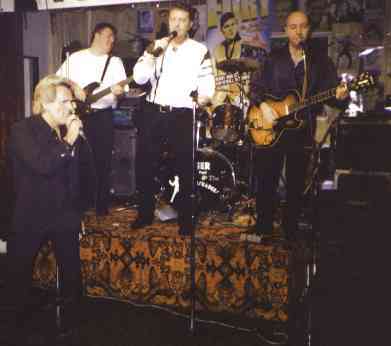 Geoff Howlett writes: Colin Paul and the Persuaders (pictured left with enthusiastic backing singers) were brilliant. Stars In Their Eyes winner Dean Memphis as Shakin' Stevens was on top form. Richard Leeman played a solid set of rock 'n' roll numbers. Albie joined Colin on stage on Saturday night and proved what a great performer he is. Dancing? Loads of it. Dress? Some of the costumes were out of this world but the people were so friendly - as long as you didn't try to sit in their seats. Albie was giving everything, as he caressed the ballads and belted out the rockers in a comprehensive parade of Billy's hits. Barely fifteen feet away stood the boys' Mum. The words of the songs were on her lips, but the real message was unvoiced. It could be read in the sparkle of her eyes and the delight on her face, as pride simply radiated from her. 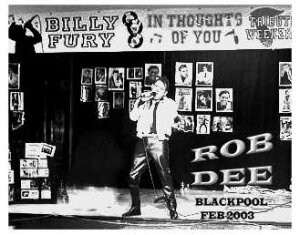 The weekend festival at the Carousel Hotel, Blackpool, was a brilliant, joyous celebration of Billy's life and work. 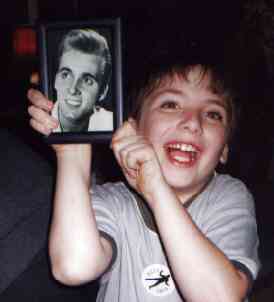 For me, the payoff was the experience of being with a couple of hundred happy, kind and friendly people, and the privilege of sharing that experience with Billy's family. Mrs Jean Wycherley is a grand, very approachable lady and Albie is one heck of a performer. Colin Paul and the Persuaders are well-established in the north-west, but their performance on the Friday night provided me with my first chance to hear them. They have a lot to offer, and I would drive a good few miles to catch them again. Their set is 100% live music - no drum machines, no voices appearing out of the ether - and it packs an almighty punch. Colin has a voice that he can deliver with several juggernauts of power, but with a full palette of colour and total control. After the Persuaders' first set, Justine, a Liverpool lovely in leather, kept the packed hall entertained for an hour with an assortment of hits from the 1960s to the 1990s. 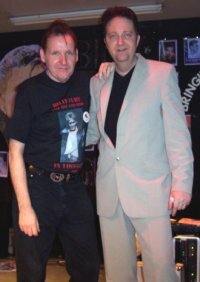 The Persuaders' second set featured a duet with Albie - Frankie Connor's poignant song Helpless, which is featured on Albie's excellent CD, I Never Met Colette. On Saturday, the Persuaders opened again, and were followed by Garry Slade, who was a revelation - six feet and a lot more of thundering rock and roll. He belted out a set of standards and had the crowd calling for more. The Persuaders' second set led into a 40 minute parade of Billy's hits by Albie. He is a real professional, who is in control of his both his presentation and his material. His performance was a celebration of his brother's talent, infused with personal dignity, and presented with respect for himself and for Billy. He produced a set of real significance, hung on a massive emotional peg, and left us all impressed with the depth of his own personality. It was a night to savour and remember. The Persuaders are Jeff Morgan, guitar; Martin Davies, bass; Tony Bolton, keyboard; Paul Atwell, drums. However, Martin missed the Saturday spot because his wife was giving birth to his first child, daughter Anna. His place was taken by Des from Vantage, who plugged the gap exceptionally, despite never having performed with the band before. 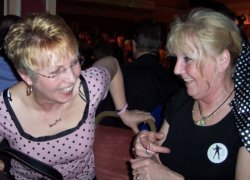 Maureen and I were with the Billy Fury e-group - Sandra, Donna, Paul, Adrian and Maggie. The weekend raised more than £1,000 towards the Bronze Fund, thanks to Chris Eley's stall and auctions. 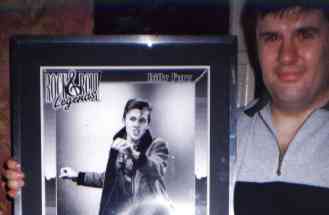 Paul splashed out £126 on Chris's auction of a print. Adrian (Paul's young son) won a raffle and was thrilled when I told him I had 130 Billy Fury photographs - but I didn't have the one he had won. On Saturday evening, a few of us adjourned to the television room, to watch Guy Clover's performance on Stars In Their Eyes. One of the most heartening aspects of the weekend was that there were so many younger people there having a great time. The 2001 calendar, the first material joint venture between this site and the Sound Of Fury fan club, was launched at the event. The first five, hand-printed, individually-numbered copies were sold in aid of the Bronze Fund. Click here to see the programme cover and here to see the programme details.